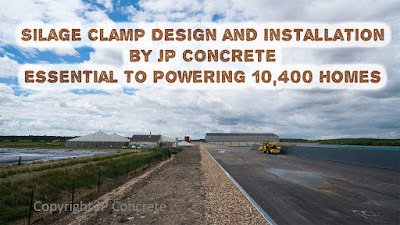 This is about Silage Clamps for Anaerobic Digestion Plants, which create renewable biogas which powers electrical generators, which supply electricity to UK homes through the National Grid. Silage clamp design and installation to comply with the UK silage clamp regulations (SSAFO Regs (UK)) is an essential component of modern anaerobic digestion plants. The humble silage clamp, is so often forgotten when reliable biogas production is discussed, but is the key to storing energy from annual harvests, so that the energy producing AD process can be fed a consistent feedstock, all year round. That very consistency of the food provided for the bacteria which create the biogas, is what ensures that power is available to those homes throughout the coldest days of winter, and hottest summer heatwaves. Designing and building silage clamps to the lowest possible budgets, which will provide a seal against loss of liquids into the environment, is not an easy one to achieve. 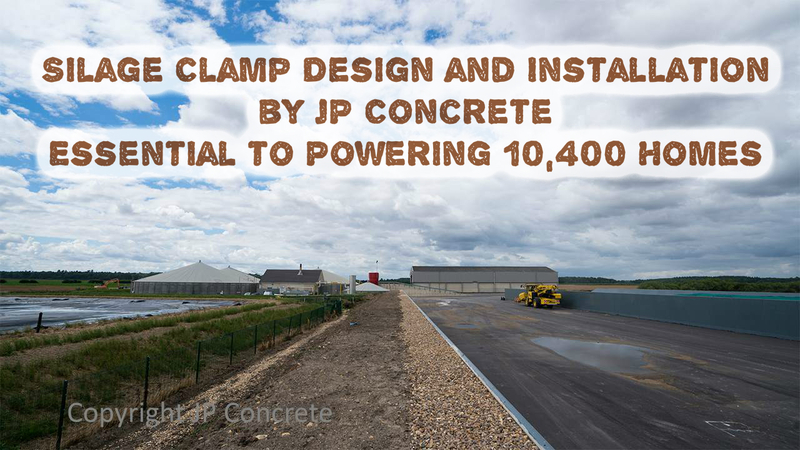 JP Concrete, has just announced that it has completed a total of seven silage clamps and storage pads, for Beeswax Dyson Farming’s AD plants in Lincolnshire that produce almost 5 Megawatts powering 10,400 homes, via the National Grid. The two silage clamps and five 50 metre by 50 metre freestanding satellite pads enable Beeswax-Dyson-Farming, to meet Silage Slurry and Agricultural Fuel Oil storage (SSAFO) regulations, and provide greater flexibility, for its harvesting and storage of energy crops such as maize, and provide greater flexibility for its harvesting and storage of energy crops, such as maize. Beeswax-Dyson-Farming’s contractors installed the earth bank retaining walls, whilst Modular-Cubed (JP Concrete’s sister company), installed the 3 metre high 5.6 tonne dividing T-wall sections. Help promote biogas production, and share this article!